Last week I wrote about Palaeolithic beads, how they were made, and what they were used for. This week I am completing this topic with a look at the largest site for finding beads from this time period, which is Poverty Point in the lower Mississippi Valley. Poverty Point is the largest and most complex Late Archaic site in North America. It was discovered in 1953 by an archaeologist who discovered the peculiar earthworks on aerial photographs taken by an Army mapmaker. This site is located in northeastern Louisiana in West Carroll County. It was in use for over one thousand years dating to between 3800 and 2500 years ago. These people produced the largest Archaic Period earthworks ever built in the United States. The house structures on this site were built on a series of six concentric semicircular embankments each measuring six feet high, 80 feet across and over 3600 feet long. A large bird effigy mound measuring 70 feet high and 640 feet across is also located on the Poverty Point site. The Poverty Point culture was made up of several large and small settlement sites located in Louisiana and Mississippi. These people had a large network of trade relationships that brought in cherts from the north, steatite from the Appalachians and many other raw materials such as galena (lead), hematite, sandstone, jasper, slate, etc. The featured Poverty Point beads in this article were found near the Poverty Point site in Louisiana but also on sites in Alabama and one in Arkansas. Attesting to the far flung trade connections that must has been in existence at that time. 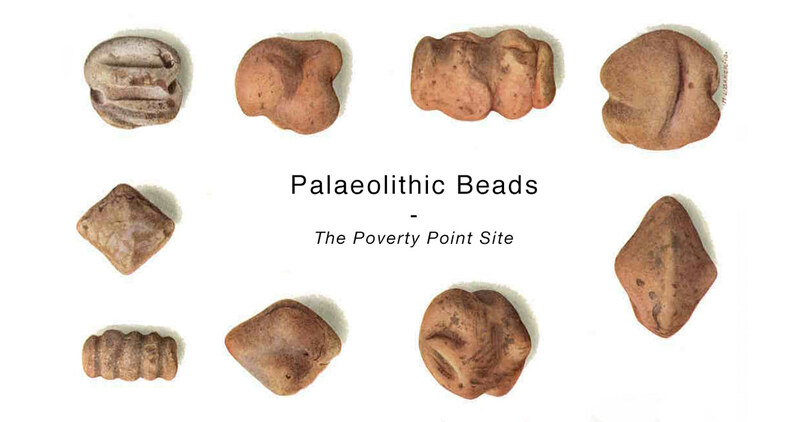 The Poverty Point culture developed a tradition of making high quality stylized carved and polished miniature stone beads. Other early cultures in the United States rarely used stone to make their beads opting for softer materials such as shell or bone. The fine cutting, engraving and polishing lapidary work these people did that resulted in such fine and unique art forms is quite remarkable. They were made in the image of many different animals that would have been common to their environment at that time. But they also made the more common tubular beads. The earliest recorded human figurines so far discovered in North America and made from fired clay were found on the Poverty Point site in Louisiana. The people who were able to craft such creative artistry as exhibited in these wonderful sculptures must have lived during a time when their lives were more at ease, not under high stress as many other cultures before and after them. A situation that benefits us all to marvel at what they left behind. One of the coolest things about all of the discoveries at Poverty Point, is that they have made an interactive online tool so that you can explore the site and get a behind the scenes peek at what they are finding. You can look up close at the artifacts they have found, and see the geography in detail. You can find it all right here.